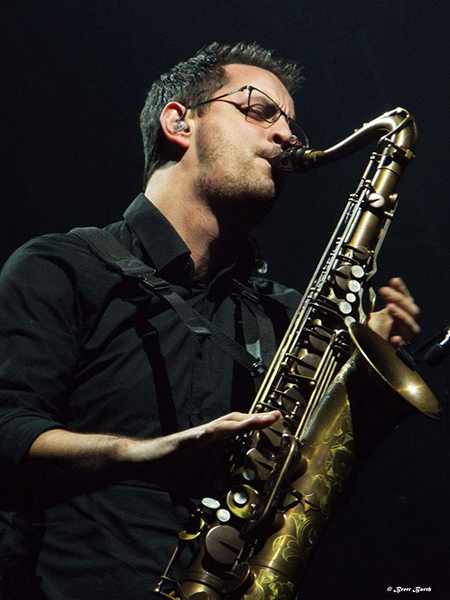 Soulful, rich and technical, Ryan's saxophone sound has become unmistakable on a range of studio recordings and live dates with some the finest musicians in the world. An alumnus of Berklee College of Music, Ryan has completed four solo recordings and countless sessions for groups of many genres. A constant call as a session woodwind player, drummer, percussionist, guitarist, bassist and keyboardist, his music can be heard all over the world. Ryan has also written a large amount of music for television and commercials, including GoPro and the NFL. As a live musician, Ryan has been fortunate enough to travel and perform all over the world. Currently, you can find him on tour with the internationally renowned band Brit Floyd playing saxophones, bass, guitar, percussion and keyboards. "[Neotech straps] have completely saved my back and neck"
"For years I've used Neotech straps and harnesses. From the early part of my career up through now, they've been there for some of my most important work, and have completely saved my back and neck during the process. There is no strap that can do what these do, and I know that I can count on such a well-made product to last for a very long time!"